As part of the plan to increase the size of the Port of Richmond along the James River, cellular cofferdams were constructed to retain the new hardstand area. The cofferdams were backfilled to a depth of approximately 40 to 50 feet with clean fine sand. The specifications required that the sheet pile interlocks not be overstressed and cause failure of the cells. The project specifications required that the newly-placed sand within and adjacent to the cells be compacted to a minimum relative density of 70 percent by vibrocompaction. 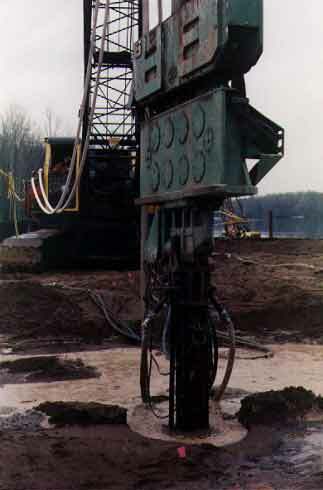 For this project, TerraSystems used our specially-designed Terraflots, which use a vibratory hammer and water jetting. The sand within the cells settled up to about four feet during the vibro operations. The movement of the individual sheets in the cofferdams cells was monitored. No movement of cells was detected. The project was subsequently constructed with no noticeable settlement of the surface pavement or lateral deformation of the cells.